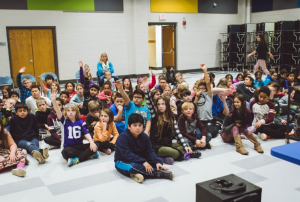 On November 16th, Protect Wisconsin Waterways was able to visit Lincoln Elementary school in Whitewater, Wisconsin. The crew had an amazing question filled time presenting to the entire 4th grade class at Lincoln. We presented our Protect Wisconsin Waterways powerpoint and demonstrated the enviroscape model. There were approximately 115 students present that day during our visit. The children were very engaged with brainstorming ideas about how they can help around their house and had a lot of questions for Splash when he paid a visit. The kids even asked about Splash’s parents and what they were doing to help out. At the end of our visit, the student proceeded to continue with their lesson about runoff, where the team was able to listen to the lesson while cleaning up.